Newly married, getting married, or still just thinking about it? First comes love, then comes marriage but, where does an estate plan come into play? 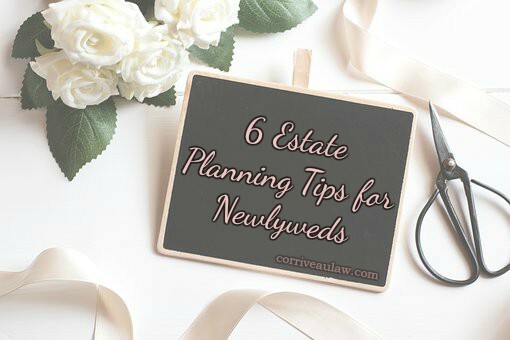 Today, we at Corriveau Law are sharing some estate planning tips for those newly married. Having an estate plan can help protect you and your finances from potential misfortune. Two lives become one but, now what? A single individual often times will name his or her parents as beneficiaries on work, life, and insurance plans. It is critically important that newlyweds change the beneficiary listed on such documents to his or her spouse should the unexpected occur. A failure to do so could leave one’s spouse completely in the dark otherwise. Banks, Credit Cards, and Insurance – Oh’ My! It is just a known fact we have a lot of ‘personal’ accounts these days. Here are a few accounts you may want to consider consolidating with your spouse. Will you have a joint bank account? Who will carry the health insurance? Marriage qualifies as a ‘special’ enrollment period to add one’s spouse. So, be sure to do so as soon as possible. Now, is the time to shop around and get the best coverage possible. This is also an ideal time to look into ‘family plans’ for your new household. If you’re like many American’s chances are you have some duplicate membership accounts as well. To best eliminate any unnecessary fees and/or expense – ditch the duplicate! Do you have an Amazon Prime, Netflix, or Costco membership? Add your spouse and start saving today. Now, that the wedding planning is done it’s time to discuss planning your Will or Trust. Do you already have one? Great, then lets get it updated and add your spouse. No Will or Trust? That’s O.K. too – call us today to set up your free initial consultation at Corriveau Law and, we will help get you started. Health and medical emergencies happen daily however; one’s spouse does not automatically get to make all medical decisions in the event that you are unable to do so. A healthcare directive or power of attorney must be assigned prior to such incidences. A power of attorney (POA) has the power over everything from your finances to medical decisions – it is recommended you meet with a qualified estate planning attorney such as Corriveau Law to assure your will is done right. NOTE: this may also be a good time to assign a secondary power of attorney should both spouses become incapacitated at a given time. Over the years you have likely accumulated a fair amount of ‘identification’ paperwork. And, in this technological age we now have more passwords and security barriers than ever before. Newlyweds, this is a great time to get all of those papers and passwords organized. A daunting task –for sure. But, think of all the time, frustration, and stress you will be saving yourself (or your spouse) in the future. Organizing and sharing of the above can certainly prevent lots of unnecessary headaches. So, don’t wait – do it today! Estate planning after one is newly married is not often times something most people want to think about. And, it can certainly feel overwhelming. However, in Michigan learning about early estate planning and quickly establishing a plan can save you much time, risk, money, and future heartache when the inevitable occurs. We at Corriveau Law congratulate you on your recent marriage. Now, together lets start planning your future estate!